Ghost Recon Wildlands, a game about mindlessly blowing stuff up because some CIA bigwig said so, added the alien hunter from Predator in an update today. What’s it like to face off against such a deadly creature? A bit like high tech whack-a-mole. A small update to Ghost Recon Wildlands adds the Predator from today until early January, throwing the dangerous, skin-flaying creature into the thick Bolivian jungle in a short side mission. It’s a great concept; Wildlands’ gunplay and atmospheric open world are among its major strengths, and a battle against a stealth camouflaged alien death beast brings both of these things into focus. Unfortunately, the boss fight itself is a bullet sponge. 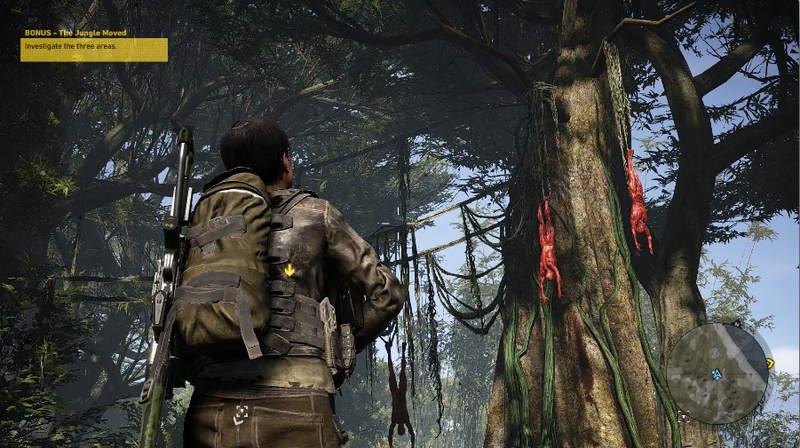 Players looking to access the boss fight will need to make their way to the eastern side of the map, deep into the Caimanes region. Here, you’ll find a frightened child in the jungle telling stories of a ghost that killed dozens of soldiers. From there, it’s a short hike to examine the situation. This is one of the best parts of the mission. Finding altars covered with bones or stumbling across skinned corpses is tense and moody. If you have your AI squad with you, there’s plenty of exaggerated chatter that feels right out of an 80s action flick. It’s a fun mixture of cheesy camp and gore-filled design that crumbles away when you finally confront the Predator. The boss fight against the Predator is a bit less impressive than the journey to find it. The alien darts around the jungle, leaping from tree to tree and sometimes rushing right next to you while nearly invisible. The sound design is standout; every footfall has weight, and the beast’s strange growl hangs on the air. I recommend turning down all in-game music to get the best experience. But it’s only exciting until you spot the pattern. The Predator will run around for a bit, drop his cloaking to roar or target you with an energy blast, and then scurry off again. 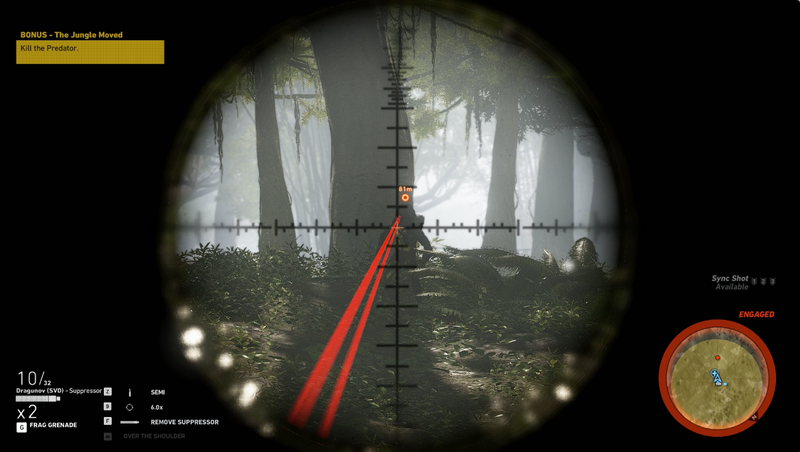 A majority of the fight is spent taking small pot-shots when you can and keeping close to cover to break line of sight when the Predator tries to shoot you back. They have a huge pool of health, turning the battle into a test of endurance and ammunition. There’s very little indication of whether you are making progress, something made worse by the fact that the Predator’s one-hit-kill attacks will often have you starting the fight over from the beginning. What could have been a tense hunt through the jungles feels like an encounter from a Metal Gear Solid rip off. Fighting the Predator works best when you approach it as the silly side mission that it really is. If you’re expecting an exciting standoff with one of Hollywood’s most iconic aliens, you’ll end up disappointed. Grab a few friends together and play after a few drinks? You might have some laughs getting your arse kicked.